‘TIS THE SEASON for election promises, and the Andrew’s Labor Party has brought out a doozy, the Suburban Rail Loop, which will form an outer ring around Melbourne, and importantly for the area, provide a station at Doncaster, finally linking Manningham into the rail network. This is not the Doncaster Rail that has long been called for, but combined with the Bus Rapid Transit service that has been proposed to run along the promised Eastern Freeway upgrade incorporated with the North East Link, this could be good news for Warrandyte commuters. It is unusual in recent times for governments to commit to such a long-term project, as the four-year election cycle does not often reward such far-sighted policy. Premier Andrews says that the Suburban Rail Loop project will transform Victoria’s public transport system, providing an underground rail connection between Melbourne’s major employment, health services, education and activity precincts outside the central business district. There is also promised to be a connection to the airport, providing a direct link for travellers without having to tackle the roads or transit via the CBD, the rail journey from Box Hill or Doncaster taking only around 30 minutes. Presently, using public transport to travel between Warrandyte and the airport can take around two hours, if travellers want to avoid travelling into the CBD to take SkyBus. “Trains on some sections of this new suburban rail loop will travel at up to 130 kilometres an hour and will be able to deliver very fast services,” Mr Andrews said at a recent press conference. Greens’ candidate for Warrandyte in the upcoming election, Ben Ramcharan told the Diary that the Suburban Rail Loop will be a much-needed addition to our public transport system, but without upgrades to existing rail lines, he fears overcrowding will continue. “I’m personally very excited to see plans for a train station in Doncaster as part of the Suburban Rail Loop. “This will bring rail services even closer to our community in Warrandyte and is something that the Greens have been pushing for for a long time,” he said. Undoubtedly, the planned project will fundamentally change public transport around Melbourne, moving from a “spoke and wheel” system to a “web”, directly connecting suburbs without the need to travel via the CBD and reducing reliance on the radial transport and road networks. It will not happen overnight, the project is expected to be completed in stages over multiple decades, with the nal completion projected out to 2050. The first stages are planned to commence construction in 2022, beginning with the south-east section from Cheltenham to Box hill and the Airport link to Sunshine. Exact project staging, timing, route and construction methodology has not yet been released, but Mr Andrews says it will be con rmed as part of the full business case for the project. Fully underground rail to minimise impacts. Further technical assessment required to determine precise station locations, staging and construction timeline as part of the full business case. Target work to commence by end- 2022. Potential sections of underground and surface rail. Technical assessment being undertaken as part of the Melbourne Airport Rail Link. Target work to commence in 2022. Further technical assessment required for this stage as part of the full business case. To be constructed in sections over a period of decades. 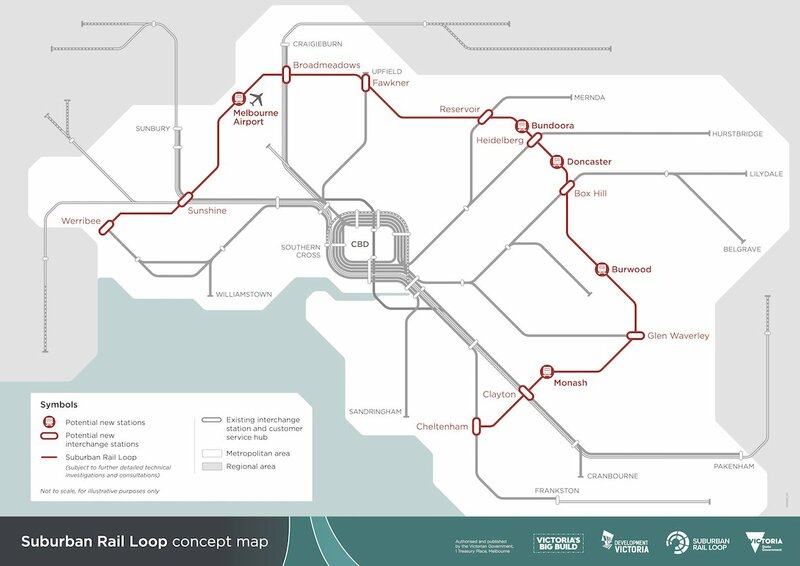 With a headline budget of $50 billion, the actual costings are yet to be released, but the Government has said that the combined Suburban Rail Loop south-east and north-east sections are expected to cost in the order of $30–50 billion, and the Melbourne Airport Rail Link section is expected to cost $8–13 billion. Local Liberal member, Ryan Smith said that while the Liberal Party supports road and rail infrastructure, he is concerned that the election promise has been developed outside Infrastructure Victoria. “The devil is in the detail, which is why this idea needs to be sent to Infrastructure Victoria for proper assessment, costing and planning,” he said. “The Andrews Government set up Infrastructure Victoria in the first place, to allegedly ‘take the politics out of infrastructure’, yet this proposal is not one that has been assessed by that agency, nor did it feature in Infrastructure Victoria’s 30-year infrastructure plan,” he said. The Government have not yet outlined the funding arrangements for the project, however the project’s Strategic Assessment states “opportunities to o set capital costs and capture value will be considered in the full business case”. “This includes direct commercial arrangements or developments at stations together with broader value capture mechanisms”. Mr Smith said he thinks this project will hit Victorians in the hip pocket. “Worryingly, Daniel Andrews won’t rule out new taxes to fund this project,” he said. $487 million to extend the Cranbourne line to Clyde, adding both Cranbourne East and Clyde railway stations. $450 million to extend the Frankston line with an electri ed, twin track to Baxter. $300 million to duplicate the Hurstbridge line between Greensborough and Eltham, rebuild Montmorency station and add carparks at Greensborough, Montmorency and Eltham stations. $77 million to increase services and improve track conditions to Shepparton. However, Mr Smith says “there will be others as the next three months progress”. Both major parties have promises of massive infrastructure plans for eastern Melbourne, with the Liberals promising to construct an East West Link before they consider developing their own plans for a North East Link. Labor is continuing its focus on public transport improvements alongside a North East Link and improved Eastern Freeway. 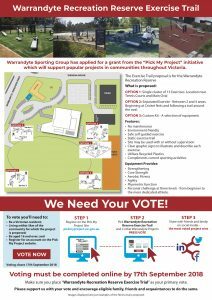 To download your copy of the September 2018 Warrandyte Diary click here!